Both candidates in the 45th Ward runoff praised Mayor Rahm Emanuel's decision to remove a Forest Glen red-light camera. FOREST GLEN — There is not much that Ald. John Arena (45th) and Chicago Police Lt. John Garrido agree on. 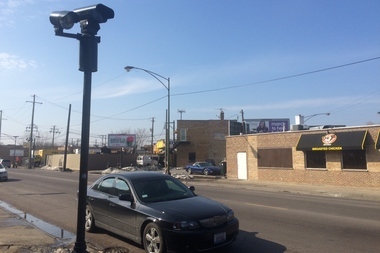 But the two longtime political foes, who will face each other in the April 7 runoff for the 45th Ward seat on the Chicago City Council, praised Mayor Rahm Emanuel's decision to remove the red-light camera that has been keeping watch on the three-way intersection of Foster, LaPorte and Elston avenues. Arena, who is the alderman who most frequently voted against Emanuel's initiatives, applauded the mayor's decision to remove 50 cameras from 25 intersections across the city, and allow drivers snapped running a red light to take an online class in lieu of paying the $100 fine for a first offense. But Arena said the mayor's actions didn't go far enough to address the problems with the red-light camera program, which the alderman called a "corrupt money-grab." "We need substantive hearings on whether the red-light camera program should continue, along with reliable data on if the cameras are effective in improving public safety," Arena said in a statement. Garrido called the removal of the cameras a good start. "This is a great opportunity for the city to conduct a study to determine the true purpose of the camera program; a way to promote safety or a revenue generator at the taxpayers expense," Garrido said in a statement. Across the city, 174 intersections are monitored by red-light cameras. The city's red-light camera program has become a hot-button issue in the mayoral runoff between Emanuel and Cook County Commissioner Jesus "Chuy" Garcia. Garcia called last week for all of the cameras to be removed, calling the program a rip-off for taxpayers. Emanuel's decision to reduce the number of cameras is pure politics, Garcia said. Other reforms announced by the mayor include a new requirement for community meetings before red-light cameras are removed, moved or added and the installation of pedestrian countdown timers at all 42 of the 174 red-light camera intersections that don't have them.